This LESS mixin will resize a background-image, via the CSS3 background-size property, so this single PNG image sprite file can be resized and reused for all icons sizes that are lower or equal to the originals. Why PNG images, why not SVG? I love working with vectorial images. They offer so much advantages. But they are time consuming. Must of the designers at my job create their icons in Photoshop pixels. 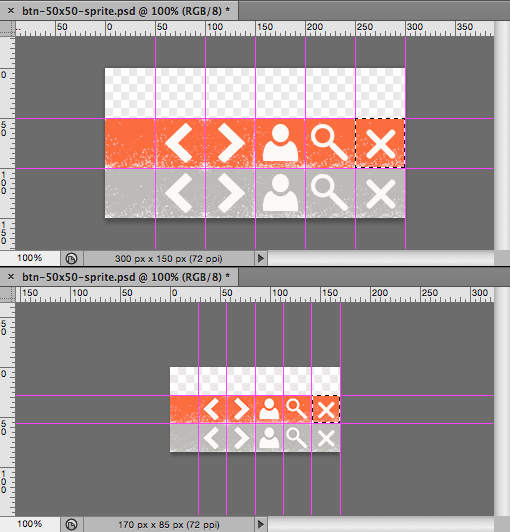 In some case, when I have free time, I lunch my FreeInk app and RE-design my icons as SVG image. But since it’s written front-end developer on my paychecks, not designer, it is hard to justify my time spent in a drawing software instead of a (code) text editor. In real (sprint demo) life HTML website development, time is money. Using PNG (24) for background-image sprites is so much faster for HTML websites that there is no real choice. CSS 3.0 background-size to the rescue! The background-size property is a stable CSS 3.0 that is supported by all modern browsers, including IE9. Web inspector screenshot showing my HTML source code and CSS code generated with my LESS mixin in it’s context. 3. @spriteIco_pxSize_original – – The original size of the icons as they are designed within the original image-sprite. 4. @spriteIco_pxRequired_value width, height The required size for THIS icon. This variable should NOT higher the the original (@spriteIco_pxSize_original). 5. @imgFile_pxSize_w – – The outter width of the original image-sprite. 6. @imgFile_pxSize_h – – The outter height of the original image-sprite. * This mixin resize a background-image via the background-size property. * * don't put the 'px', only value as digit!